BSC Speech and Language Pathology and Audiology; University of Banglore, India. Christy is a licensed paediatric speech and language therapist with extensive clinical experience in working with children and families. She is a registered member of RCI (Rehabilitation Council of India) and ISHA (Indian Speech and Hearing Association). 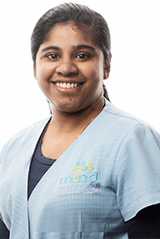 Christy has a bachelor degree in Speech-Language Pathology and Audiology from University of Bangalore, India and has a certification of Oral Placement Therapy Level 1 and 2. Christy is a committed speech and language therapist skilled in working with children individually as well as in a group setting. She has practiced speech therapy in a number of settings to include public schools, private schools, and clinics with the majority of her experience being in private practice where she has worked extensively with toddlers, preschoolers, and school-aged children. Christy specializes in the evaluation, diagnosis and treatment of a variety of communication disorders including receptive/expressive language disorders, articulation disorders, stuttering, ASD, Down Syndrome, social skills, auditory processing disorders, and other developmental delays. Christy works closely with individuals and their families to facilitate effective communication skill development and implementation.